Autorun Deleter is a free program which disables and deletes the Autorun.inf virus. While most anti-virus can delete it, some may miss it – more so because it is a stubborn one and keeps coming back. 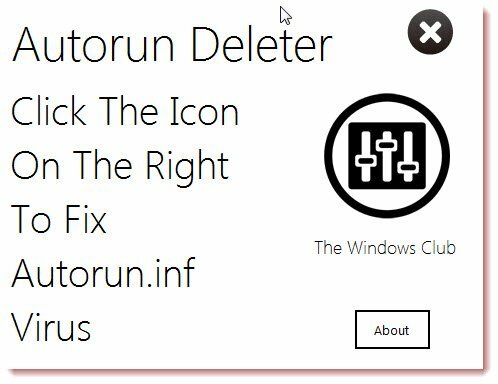 Autorun Deleter has been developed by TWC Forum member Paras Sidhu and you can download it by clicking here. If you have any questions its developer will be happy to respond here. UPDATE: Autorun Deleter has been scanned at Jotti and the file is clean. If some AV's report it as a suspicious file, rest assured its a false positive. Since I don't really understand what this does, I hope for an explanation. This app is an antivirus tool but it has the limited functionality of being able to delete autorun.inf virus only. Understand? I have a few questions... Can you not just delete the infected autorun.inf file? What if it deletes the genuine autorun file? When exactly do you use it? After you connect the USB? No, you can't, but you can. You can delete the infected autorun.inf file but It will come back again as you delete it. This app won't delete the file but make some registry settings which will stop autorun.inf virus from running. Is it ok? I was looking at your twitter account and found this Autorun Deleter and when I clicked on it MSE reported a Trojan the first time. I just clicked on it now to make sure and it didn't come up I don't know if it's because I took action the first time with MSE or not. I got Autorun Deleter scanned at Jotti and the file is clean. If you have installed all Microsoft security updates and have not re-enabled autorun, then you won't need the tool.